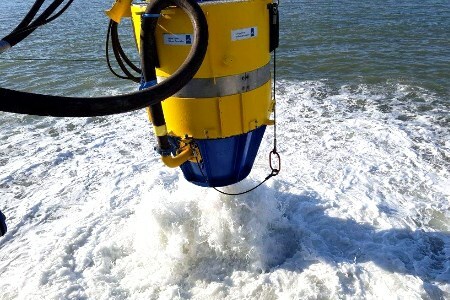 Global subsea excavation specialist James Fisher Subsea Excavation (JFSE), a part of James Fisher and Sons plc, has announced the introduction of centrally located jetting systems to its mass/controlled flow excavation (M/CFE) equipment spreads. Moving away from customary designs which place jets at the side of M/CFE tools, JFSE’s innovative technology dramatically reduces velocity degradation. JFSE’s excavators will now be capable of cutting soils with shear strengths up to double that which any other M/CFE system can realise. JFSE is the only M/CFE provider that can place its jets centrally. Commenting on this latest M/CFE innovation, Graham Murdoch, Technical Director at JFSE, said: “We are committed to using our world-leading knowledge and expertise to continue to lead innovation in the sector. Our developments are all designed to bring very real, tangible benefits to our clients. “Continuously evolving our service with advancements such as the centrally located jetting system further cements our position as the leading and most versatile M/CFE provider in an ever-changing global market. The jets are now being fitted to JFSE tools which are stationed at strategic hubs in the UK, UAE, Singapore, Venezuela, USA, Brazil, China and Mexico. JFSE is the only M/CFE company capable of working simultaneously on multiple projects worldwide and, as part of the James Fisher group, it has access to bases and sister company expertise in more than 40 countries. To date, the highly experienced management and engineering teams are responsible for the successful completion of more than 460 projects. JFSE’s fleet of 30 equipment spreads provides a non-contact form of excavation that eliminates the risks associated with other excavation methods. Further enhancing their capabilities, the tools have the additional benefit of real time sonar imaging which enables precision excavation. The tools are used for applications including pipeline and cable trenching, deburial, rock dump dispersal and seabed clearance and preparations. The M/CFE spreads are ideal for moving materials such as sand, silt and mud, drill cuttings, clay and rock dump.